Is this the first ever portrait of Jesus? The tiny booklet, a little smaller than a modern credit card, is sealed on all sides and has a three-dimensional representation of a human head on both the front and the back. One appears to have a beard and the other is without. Even the maker’s fingerprint can be seen in the lead impression. Beneath both figures is a line of as-yet undeciphered text in an ancient Hebrew script. The owner of the cache is Bedouin trucker Hassan Saida who lives in the Arab village of Umm al-Ghanim, Shibli. He has refused to sell the booklets but two samples were sent to England and Switzerland for testing. The area is renowned as an age-old refuge for ancient Jews fleeing the bloody aftermath of a series of revolts against the Roman empire in the First and early Second Century AD. 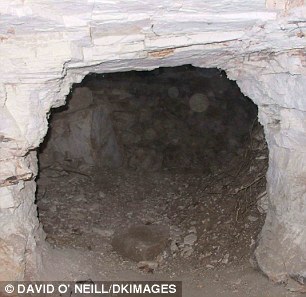 The cave is less than 100 miles from Qumran, where the Dead Sea Scrolls were discovered, and around 60 miles from Masada, scene of the last stand and mass suicide of an extremist Zealot sect in the face of a Roman Army siege in 72AD – two years after the destruction of the Second Temple in Jerusalem. It is also close to caves that have been used as sanctuaries by refugees from the Bar Kokhba revolt, the third and final Jewish revolt against the Roman Empire in 132AD. The era is of critical importance to Biblical scholars because it encompasses the political, social and religious upheavals that led to the split between Judaism and Christianity. It ended with the triumph of Christianity over its rivals as the dominant new religion first for dissident Jews and then for Gentiles. In this context, it is important that while the Dead Sea Scrolls are rolled pieces of parchment or papyrus containing the earliest-known versions of books of the Hebrew Bible and other texts – the traditional Jewish format for written work – these lead discoveries are in book, or codex, form which has long been associated with the rise of Christianity. 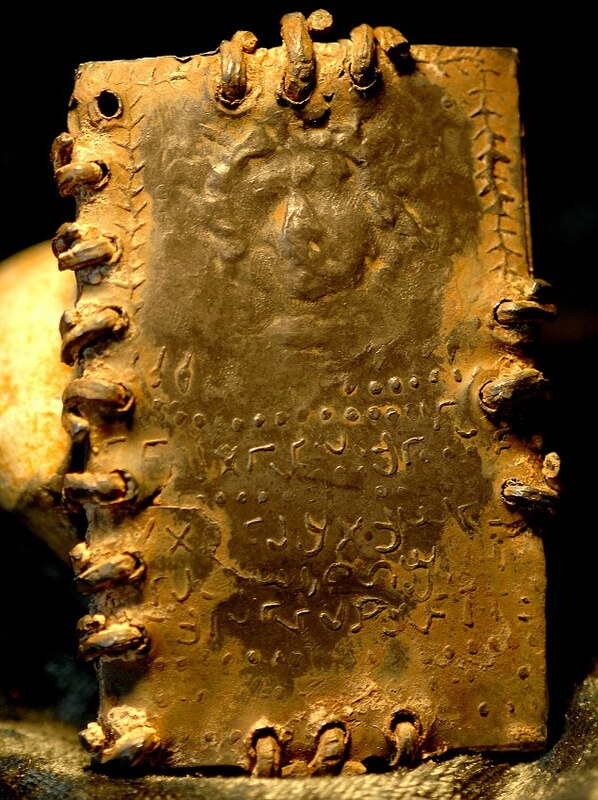 The codex showing what may be the face of Christ is not thought to have been opened yet. Some codices show signs of having been buried – although this could simply be the detritus resulting from lying in a cave for hundreds of years. Unlike the Dead Sea Scrolls, the lead codices appear to consist of stylised pictures, rather than text, with a relatively small amount of script that appears to be in a Phoenician language, although the exact dialect is yet to be identified. At the time these codices were created, the Holy Land was populated by different sects, including Essenes, Samaritans, Pharisees, Sadducees, Dositheans and Nazoreans. There was no common script and considerable intermingling of language and writing systems between groups. Which means it could take years of detailed scholarship to accurately interpret the codices. Many of the books are sealed on all sides with metal rings, suggesting they were not intended to be opened. This could be because they contained holy words which should never be read. For example, the early Jews fiercely protected the sacred name of God, which was only ever uttered by The High Priest in the Temple in Jerusalem at Yom Kippur. The original pronunciation has been lost, but has been transcribed into Roman letters as YHWH – known as the Tetragrammaton – and is usually translated either as Yahweh or Jehovah. A sealed book containing sacred information was mentioned in the biblical Book of Revelations. One plate has been interpreted as a schematic map of Christian Jerusalem showing the Roman crosses outside the city walls. At the top can be seen a ladder-type shape. This is thought to be a balustrade mentioned in a biblical description of the Temple in Jerusalem. Below that are three groups of brickwork, to represent the walls of the city. A fruiting palm tree suggests the House of David and there are three or four shapes that appear to be horizontal lines intersected by short vertical lines from below. These are the T-shaped crosses believed to have been used in biblical times (the familiar crucifix shape is said to date from the 4th Century). The star shapes in a long line represent the House of Jesse – and then the pattern is repeated. This interpretation of the books as proto-Christian artefacts is supported by Margaret Barker, former president of the Society for Old Testament Study and one of Britain’s leading experts on early Christianity. The fact that a figure is portrayed would appear to rule out these codices being connected to mainstream Judaism of the time, where portrayal of lifelike figures was strictly forbidden because it was considered idolatry. The revolt established an independent state of Israel over parts of Judea for two years before the Roman army finally crushed it, with the result that all Jews, including the early Christians, were barred from Jerusalem. The followers of Simon Bar Kokhba, the commander of the revolt, acclaimed him as a Messiah, a heroic figure who could restore Israel. Although Jewish Christians hailed Jesus as the Messiah and did not support Bar Kokhba, they were barred from Jerusalem along with the rest of the Jews. The war and its aftermath helped differentiate Christianity as a religion distinct from Judaism. the codices carry the name of Rabbi Bar Yochai. Feather says that all known codices prior to around 400AD were made of parchment and that cast lead is unknown. They were clearly designed to exist for ever and never to be opened. 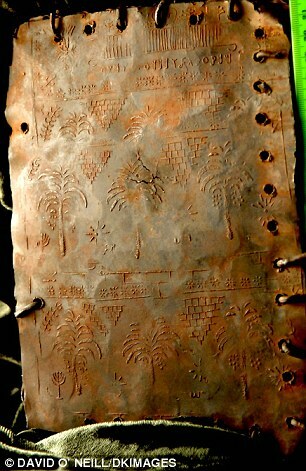 The use of metal as a writing material at this time is well documented – however the text was always inscribed, not cast. The books are currently in the possession of Hassan Saida, in Umm al-Ghanim, Shibli, which is at the foot of Mount Tabor, 18 miles west of the Sea of Galilee. Saida owns and operates a haulage business consisting of at least nine large flatbed lorries. He is regarded in his village as a wealthy man. His grandfather settled there more than 50 years ago and his mother and four brothers still live there. However, The Mail on Sunday has learned of claims that they first came to light five years ago when his Bedouin business partner met a villager in Jordan who said he had some ancient artefacts to sell. The business partner was apparently shown two very small metal books. 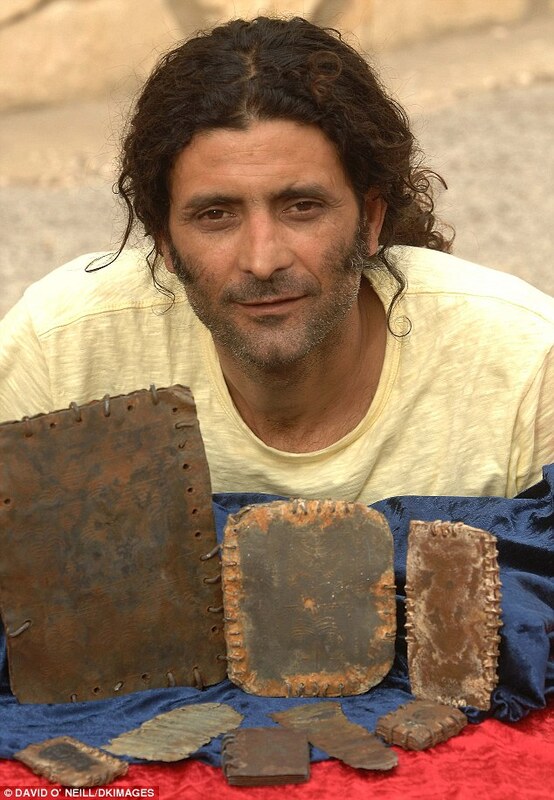 He brought them back over the border to Israel and Saida became entranced by them, coming to believe they had magical properties and that it was his fate to collect as many as he could. The arid, mountainous area where they were found is both militarily sensitive and agriculturally poor. The local people have for generations supplemented their income by hoarding and selling archeological artefacts found in caves. More of the booklets were clandestinely smuggled across the border by drivers working for Saida – the smaller ones were typically worn openly as charms hanging from chains around the drivers’ necks, the larger concealed behind car and lorry dashboards. In order to finance the purchase of booklets from the Jordanians who had initially discovered them, Saida allegedly went into partnership with a number of other people – including his lawyer from Haifa, Israel. When he first obtained the booklets, he had no idea what they were or even if they were genuine. He contacted Sotheby’s in London in 2007 in an attempt to find an expert opinion, but the famous auction house declined to handle them because their provenance was not known. Soon afterwards, the British author and journalist Nick Fielding was approached by a Palestinian woman who was concerned that the booklets would be sold on the black market. Fielding was asked to approach the British Museum, the Fitzwilliam Museum in Cambridge and other places. Fielding travelled to Israel and obtained a letter from the Israeli Antiquities Authority saying it had no objection to their being taken abroad for analysis. It appears the IAA believed the booklets were forgeries on the basis that nothing like them had been discovered before. None of the museums wanted to get involved, again because of concerns over provenance. Fielding was then asked to approach experts to find out what they were and if they were genuine. David Feather, who is a metallurgist as well as an expert on the Dead Sea Scrolls, recommended submitting the samples for metal analysis at Oxford University. The work was carried out by Dr Peter Northover, head of the Materials Science-based Archaeology Group and a world expert on the analysis of ancient metal materials. Meanwhile, the politics surrounding the provenance of the books is intensifying. Most professional scholars are cautious pending further research and point to the ongoing forgery trial in Israel over the ancient limestone ossuary purporting to have housed the bones of James, brother of Jesus. The Israeli archeological establishment has sought to defuse problems of provenance by casting doubt on the authenticity of the codices, but Jordan says it will ‘exert all efforts at every level’ to get the relics repatriated. The debate over whether these booklets are genuine and, if so, whether they represent the first known artefacts of the early Christian church or the first stirrings of mystical Kabbalah will undoubtedly rage for years to come. If he is right, then we really may be gazing at the face of Jesus Christ. Pretty amazing find. I saw this the other day, and was thinking about how it was actully the work of someone making this all from lead. Something that it seems to also be, I wonder is this one of the first spiral bound books ever made? I've never seen that technique ever done before. Whatever it turns out to be, it could reveal alot about early Christianity. I wonder if that translation "Savior of Israel" will be confirmed anytime soon? Awesome post. Just noticed the books are bound 360 degrees around, not just on one side. Would you love to also see the tools that were used to make the book, the molds, how they punched the holes and make the lead wire? I was just thinking about the binding. They bound it to last, that's for sure. And, lucky for us, it lasted. I often wonder how much has knowledge has disappeared or been destroyed throughout our history. I read about this it's pretty cool..I guess right now thye are doing their best to see if it was hoaxed in soem way and so far it's been passing tests done. They might be forgeries, made in the last 50 years. Welcome to the second installment of "Closer Look," a regular feature in which we'll scrutinize some recent high-profile claims and assess just how well they hold up. Last time around we took on Donald Trump, Alan Greenspan, and BP. (It might not shock you to learn that none of their claims fared all that well.) This time, we'll take a look at lead codices that some say could shed light on early Christian history; claims about spending cuts in the budget just passed by Congress; and an assertion by President Obama about the origins of our deficit problem. The lead codices: As we told you last month, some biblical scholars believe a trove of 70 lead codices that turned up five years ago in a remote cave in eastern Jordan may date from the 1st Century C.E. They say that references to the Messiah in the codices--which are made up of wirebound individual pages, roughly the size of a credit card--could bear invaluable testimony to the last days of Jesus' life. Much of the media ate the story up. "Never has there been a discovery of relics on this scale from the early Christian movement, in its homeland and so early in its history," reported the BBC. But it's looking more and more like the codices are fakes. The "expert" who helped convince the media of that the codices might be authentic turns out to be a fringe figure at best. Meanwhile, Peter Thonemann, a prominent scholar of ancient history at Oxford University, found that two phrases of text in the codices came from an ordinary Roman tombstone on display in a museum in Jordan, suggesting that a forger had simply copied the lines from the tombstone. Thonemann pronounced the codices "a modern forgery, produced by a resident of Amman within the last fifty years or so." Other scholars have also cast serious doubt on the codices' authenticity. In short, we can't say with absolute certainty that the codices are forgeries--but that's certainly what the balance of evidence suggests. So we've assigned the claim that the codices are an important new archaeological find to the second lowest level on our gauge--one step above flat-out bogus. Ever wonder why none of these alleged ancient finds ever refutes currently held doctrine? Like, you can bet nothing will ever be found admitting there was no Jesus or he was just a regular guy people deified after his death, like they would've koresh or jeffs if they lived 2000 years ago? "Shekem_ur_Shekem" wrote: Ever wonder why none of these alleged ancient finds ever refutes currently held doctrine? Like, you can bet nothing will ever be found admitting there was no Jesus or he was just a regular guy people deified after his death, like they would've koresh or jeffs if they lived 2000 years ago? It isn't likely that any find would contradict what we have today. Since what we have today is based on accurate, historical records of the live of Christ. It's also no like that Koresh or Jeffs would ever be deified since neither has been seen alive after they were confirmed to be dead. Jesus was never deified by his followers. His Deity was realized by those who followed Him. There is a big difference.